Rachel views the therapeutic journey to healing and growth as both empowering and transformational. Using collaboration, Rachel and her clients work to find opportunities for new ways of thinking and behaving in order to improve the quality of their lives. Her ability to focus on individuals’ truths within their environments encourages her clients to draw upon their core strengths to create sustained, positive changes. Clients working with Rachel will also be able to access and heal the roots of their emotional wounds, helping them begin to again feel whole and free. Rachel received her B.A. in Psychology from Barnard College of Columbia University, and earned her Masters in Social Work from George Warren Brown School of Social Work at Washington University. She completed post-graduate clinical training in Advanced Psychodynamic Psychotherapy from the St. Louis Psychoanalytic Institute. 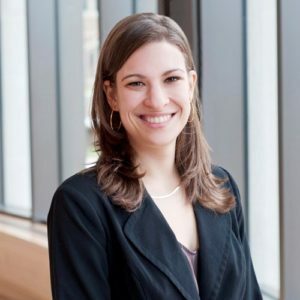 Drawing upon a diverse clinical training background, Rachel incorporates a variety of approaches into her practice, including Trauma-Focused Cognitive Behavior Therapy (TF-CBT), Cognitive Behavioral Therapy (CBT), Dialectical Behavior Therapy (DBT), Psychodynamic Psychotherapy, and mindfulness. Her experience allows her to tailor her therapeutic interventions to meet the needs of each individual. Rachel provides treatment to children, preteens, adolescents, adults, and families. She works with those experiencing distress resulting from anxiety, anger, depression, complex-trauma, grief, inner-criticism, intimate partner violence, relationship and family conflicts, sexuality and gender identity exploration, and systematic oppression and discrimination. One of Rachel’s specialty areas is in Trauma Focused CBT with children ages 10-17. TF-CBT aims to reduce the symptoms of trauma through: educating the child and parent about the effects of trauma, teaching skills for stress management, learning to work through difficult thoughts and feelings related to the trauma, and gradually working through memories of the traumatic event(s). Rachel offers a sliding scale. To make an appointment please call her directly at 314-561-9757 X714.